Good morning to you on this crisp, cold day. Yes, the temperatures have gone down this week here in Toronto and I have had to wear my winter coat when on outdoor duty at school. Right now I can hear the frigid wind howling outside and I am not looking forward to going out to do my weekly grocery shopping. If we were having coffee, I would tell you that the week ended on a positive note. As I locked my classroom door yesterday afternoon, I had a sense of satisfaction that all my assessments and marking are up to date. This week my students presented their projects for the inquiry on structures (designing and building a structure with recyclable materials) and the presentations went well. The children had done their best work and were very proud to show and explain to their classmates what they had done. In addition to building with boxes and cylindrical shapes, my students had the opportunity to build a windmill with moving parts using wood, a hammer, and nails (refer to Wednesday’s post on woodworking). 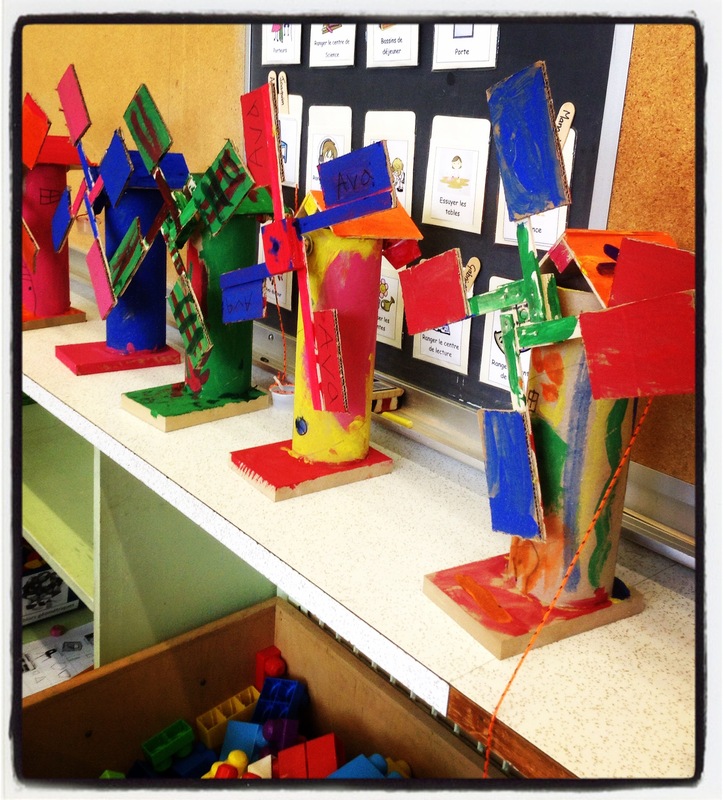 On Wednesday afternoon, I gave the children a chance to decorate their windmills and paint them. Their work was the envy of others when they carried the completed project home after school. Nothing eventful has happened in the past week aside from completing a unit of work in class. I have started a new inquiry in the classroom with my children – we are to explore Living Things. I have many ideas whirling about in my head but I shall only put them into practice once I have done the Demonstration Classroom with my collegue. My focus right now is preparing for the morning that is to happen in about two weeks. We have introduced the children to Popplet, the app we will be using, and I have offered the children vocabulary games to play. I look forward to seeing what the next week will bring. Even though all my marking is up to date, this weekend I will spend some time planning as well as creating some cards to add to my word wall of animals. During our class discussion, the children came up with many words that I did not think of. I would like to add their contribution to the wall in order to make the vocabulary list more relevant to them. If we were having coffee, I would wish you well for the following week. I forsee a busy one for me which will hopefully end on a high note. I love the windmills, those are great. I bet the children will be thrilled to get their words on your wall that’s so nice of you to include them and make them feel important that way. They will treasure their windmills for years, I m sure of it. I enjoy the kids’ contributions to the classroom. It makes them feel a part of the community I think. It sounds like you and the kids are going to have an exciting week. It’s wonderful to see how you inspire them to be creative. I am hoping I can figure out a way to share the creative work the children. Are to do in the next few weeks. We will be doing the task with the iPad. As it is my first time doing this, I still have to figure it out. Google is a wonderful tool – and pinterest has some wonderful ideas on hand too. The wind mills are impressive. Looking forward to hearing about other projects. Have great weekend and time off. The children had such fun making them and it is an activity I will definitely do with the children next year. If were were having coffee together, I’m having a cup myself right now, I would say this week has been interesting. God is revealing Himself in the details. I should have a second part-time job soon so that I can move forward in the transition. I have been reading a lot and writing a lot. I feel excitement coming on from doing the work I need to. There is a good feeling when you put the work in for your dreams and goals. It is rainy and rather cold today in Las Vegas. However, I feel a coziness today. Maybe it’s the writing, the revelation from God, or just being thankful for today, rain and all. If we were having coffee, I would say thank you for the friendship, transcendent from the physical. Thank you for asking about me. Have a blessed week and I look forward to having coffee with you again soon. Sounds like there are many positive things happening in your life right now and that you are on your way to fulfilling God’s plan for you. Sounds exciting. Hi Colline. It sounds like you had a positive week. The weather is cold here too in Michigan. In fact, it’s snowing right now. We’ve had more snow in the last 2 weeks than in February! Crazy. I hope next week is a good one. The weather seems carzy this year, doesn’t it? It seems worse when all we want is to experience spring and warm weather. Yes, absolutely. It’s snowing today and the forecast is 69 degrees for Saturday. Crazy is the word! Crazy cold here too! Yesterday was snow but today is sunny and warmer. Your unit on Living Things reminds me of when our third graders “raised” meal worms so they could watch the changing life cycles. After they had gone from worm to pupa to beetle, we took them outside and set them free. That is the life cycle project in our other elementary school! Their mascot is even the Monarch! Have fun. I would be interested to hear more about your Shoreeline project. Are you organising a big production? They were extremely proud of what they had created. Thank you Paula. The children are so proud of their work.